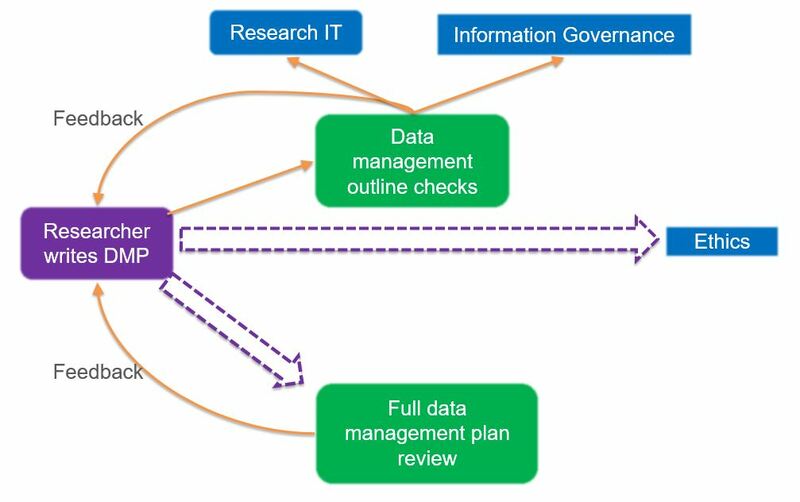 Eight months on from a major revision of data management planning processes at the University of Manchester, we’re often asked about how we work and so we thought it might be useful to share how we created a process that gives researchers maximum value from creating a Data Management Plan (DMP) and assists in the University’s compliance with GDPR. The University of Manchester has required a DMP for every research project for nearly 5 years, as have most major UK research funders, and we had an internal data management planning tool during this period. Whilst this tool was heavily used we wanted something that was more user-friendly and easier to maintain. 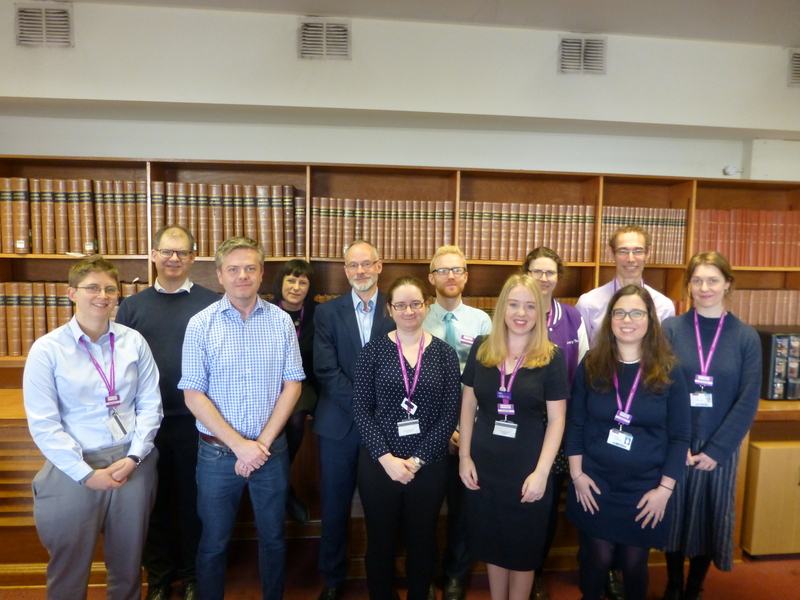 We were also keen on having a tool which would allow Manchester researchers to collaborate with researchers at other institutions so turned to DMPonline, maintained by the Digital Curation Centre. Once the decision had been taken to move to DMPonline we took the opportunity to consider links to the other procedures researchers complete before starting a project to see if we could improve the process and experience. We brought together representatives from the Library, Information Governance Office, Research IT, ethics and research support teams to map out the overlaps in forms researchers have to complete before beginning research. We also considered what additional information the University needed to collect to ensure compliance with GDPR. We established that whilst there were several different forms required for certain categories of research, the DMP is the one form used by all research projects across the University and so was the most appropriate place to be the ‘information asset register’ for research required under GDPR. To achieve this we carefully considered all existing forms. We identified where there were overlaps and agreed on wording we could include in our DMP templates that would fulfil the needs of all teams – not an easy task! We also identified where duplicate questions could be removed from other forms. The agreed wording was added to our internal template and as a separate section at the beginning of every funder template as the ‘Manchester Data Management Outline’ to ensure unity across every research project at the University. Once we had agreed on the questions to be asked we designed a process to share information between services with minimal input from researchers. 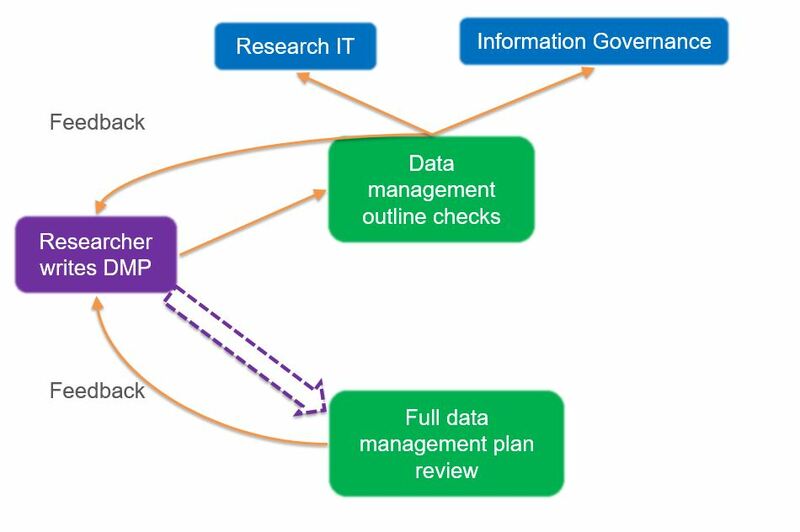 Once a researcher has created their plan the journey of a DMP begins with an initial check of the ‘Manchester Data Management Outline’ section by the Library’s Research Data Management (RDM) team. Here we’re looking for any significant issues and we give researchers advice on best practices. We ensure that all researchers who create plans are contacted, so that all researchers benefit from the process, even if that is just confirmation that they are doing the right thing. If the issues identified suggest the potential for breaches of GDPR or a need for significant IT support, these plans are sent to the Information Governance Office and Research IT respectively. At this point all researchers are also offered the option of having their full DMP reviewed, using DMPonline’s ‘request feedback’ button. If researchers take up this service – and more than 200 have in the first eight months – we review their plans within DMPonline, using the commenting functionality, and return the feedback to the researcher within 10 working days. If a research project requires ethics approval, researchers are prompted whilst filling in their ethics form to attach their DMP and any feedback they have received from the Library or other support services. This second step was introduced shortly after the move to DMPonline so that we could ensure that the advice being given was consistent. These processes ensure that all the relevant services have the information they need to support effective RDM with minimal input from researchers. On 17th April a message was sent to all researchers informing them of the change in systems and new processes. Since then Manchester researchers have created more than 2000 DMPs in DMPonline, demonstrating brilliant engagement with the new process. Sharing information between support services has already paid dividends – we identified issues with the handling of audio and video recordings of participants which contributed to the development of a new Standard Operating Procedure. Whilst we have seen significant activity in DMPonline and a lot of positive feedback about our review service there are still improvements to our service that we would like to make. We are regularly reviewing the wording of our questions in DMPonline to ensure that they are as clear as possible; for example, we have found that there is frequent confusion around the terminology used for personal, sensitive, anonymised and pseudonymised data. There are also still manual steps in our process, especially for researchers applying for ethics approval, and we would like to explore how we could eliminate these. Our new data management planning process has improved and all the services involved in RDM-related support at Manchester now have a much richer picture of the research we support. The University of Manchester has a distributed RDM service and this process has been a great opportunity to strengthen these links and work more closely together. Our service does not meet the ambitious aims of Machine Actionable DMPs but we hope that it offers an improved experience for the researcher, and is a first step towards semi-automated plans, at least from a researcher perspective.